"Traditional Danish breakfast treat that's a cross between a pancake and a popover. Made using a special aebleskiver pan. Often served during Christmastime. Serve with confectioners sugar sprinkled over top. Maple syrup or jam are also delicious! " Sift the flour, salt, and baking soda together in a bowl. Add the buttermilk and egg yolks; stir until you have a batter. In a separate large glass or metal mixing bowl, beat the egg whites until foamy until soft peaks form. Lift your beater or whisk straight up: the egg whites will form soft mounds rather than a sharp peak. Fold the egg whites into the prepared batter. 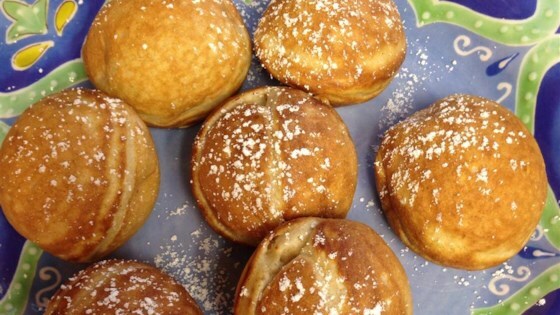 Place an aebleskiver pan over medium heat; prepare each cup with cooking spray. Pour the batter into each cup to about 2/3 full. Cook until golden brown on each side, using a toothpick to flip, 1 to 2 minutes per side. if you eat them without jam, jelly, or some type of syrup to sweeten them, they are bland & boring. Maybe I will try to use the pan with a better pancake recipe. The dogs enjoyed them greatly. These were delicious. Really cute, lovely texture, with a homey pancake flavor. Loved mine with fruit jam or syrup.